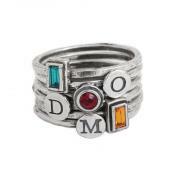 These silver stacking birthstone name rings look great as an individual ring, or stacked together! Wear one to represent each of your children or grandchildren, or wear your own name and birthstone! 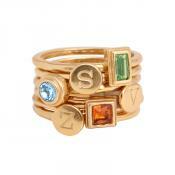 Stackable birthstone rings are available in all the birthstone colors. 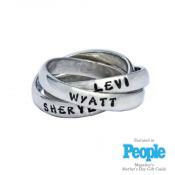 They can be custom stamped and stacked together. What a great way to commemorate a child's birth, special date, or family pet! Also looks great as a class ring with the birthstone as the school color. 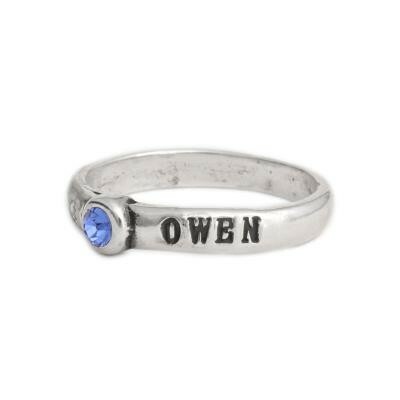 Simply select your size and birthstone month, then type in the text box what you would like stamped on your ring. I ordered 4 of these stackable name/birthstone rings to represent each family member to create a unique and beautiful family ring- the quality of materials is second to none and they are gorgeous together. 4 rings just fit together comfortably on my finger. It is truly a work of art. I have received numerous compliments on it but more importantly it is a piece I will cherish forever. Customer service is awesome- highly recommended!